With today’s sophisticated and well-informed buyers, the “standard” value proposition just doesn’t cut it anymore. That, coupled with increasing competition, makes communicating the uniqueness of your offer and what truly differentiates you from all the other available alternatives very challenging. In this dynamic keynote address you will learn how to create a buyer-focused message that SELLS. Get the highlights of buyer research that provides actionable steps to transform your messaging both in content creation and in the field with sellers. What does tuning your message to a buyer entail? The most desired attributes to get your offer on the short list. Learn the steps to shift focus from product to buyer experience. 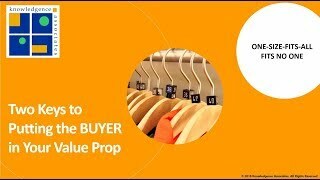 Do a “weakness check” on your value prop to avoid common mistakes. Learn the keys to message alignment that drive decision making. The market gets noisier and the challenges of coming up with a convincing sales message only get harder. What drives buyers in an environment where everyone has the latest and greatest? Both marketers and sellers need to truly communicate the business imperatives that buyers need to drive to success. Only value propositions that align your buyer’s needs with your offering will get attention. 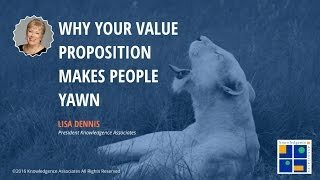 In this keynote you will hear highlights of buyer research on how Value Propositions factor into Buying Decisions. How to tune your message with buyers to gain traction. Learn the real impact of value propositions on getting on the short list. Learn how to shift to more customer-focused, rather than product/service focused statements. Hear how to remove the top 5 weaknesses that technology value props suffer from. Learn message alignment to drive home customer success stories. Make Your Value Proposition "Sales Ready"
Tired of fulfilling requests for more white papers and case studies from your sales force? The shift in control from the seller to the buyer in today’s markets make it even harder to consistently delivery messaging that is both consistent and flexible to drive buyer engagement. This address will explore that the first place to really “tool-up” is your offering’s value proposition. But the challenge is that most of us have never even received any training on how to construct a really good one. How do you tell? The real proof is when your sales people can deliver a solid message consistently across all their prospects and can drive through the buyer journey. The typical value proposition isn’t geared up to be used by sales “in conversation.” Connecting the dots between buyer needs and a product- focused value proposition is hard and not every sales person can do it well. Learn how to deliver a consistent and “sales Ready” message and the content-set that will help sales people deliver the right buyer conversation path that closes deals. Learn how to assemble a Value Proposition Messaging Playbook for field and inside sales: mapping the Sales Conversation across the buyer journey; modular messaging that can pivot based on key targets’ needs. Hear about developing Value Drivers, quantification and proof to bolster your story, serving up the message points to begin, progress and close the conversation. Explore tailoring discovery questions that begin the buyer journey. Lisa is a sought-after dynamic speaker. 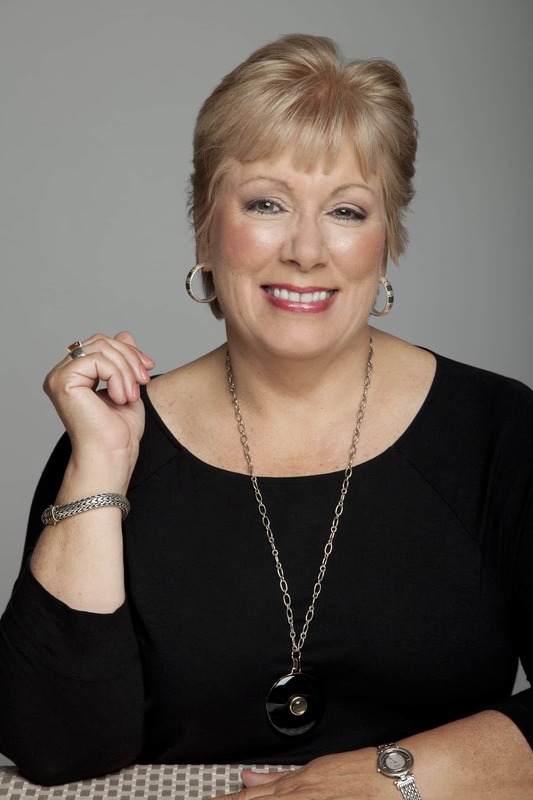 She brings over thirty years of marketing and sales experience to her keynote and featured presentations, with a strong background in B2B strategy and execution. Lisa is President of Knowledgence Associates. She has worked with companies across a broad range of industries (specialty in high technology, healthcare, insurance, manufacturing, and professional services) including Akamai, Citrix, CSC, Dell, FedEx, HP, Hitachi, IBM, Microsoft, Mutual of Omaha, Tufts Health Plan, Verizon, Wipro and many others. An author, Lisa is currently working on a new book: Value Propositions that Sell: Turning Your Message into a Magnet that Attracts Buyers, due out in 2018. She also has launched an online training program for value proposition development, called The Simple Value Proposition Plan. 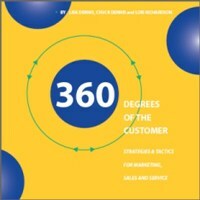 Lisa has been a guest blogger for TechTarget, Kite Desk, and Pipeliner CRM, MassHighTech.com, and a co-author of the book, 360 Degrees of the Customer – Strategies & Tactics for Marketing, Sales and Service. She was the president of the Boston chapter of Sales and Marketing Executives International (SMEI), as well as sitting on its international board. She also co-founded Sales & Marketing Innovators in the Boston area. Lisa has held non-profit board seats for Positive Directions, the YWCA of Cambridge, and The Children’s Room. She has a B.A in Writing from Wheaton College, and an MBA in Marketing from Babson College.